Venerable Maxim was a priest in the town of Totma in the Russian North during the early seventeenth century. He was called Maxim Makarev, son of Pope (priest). He was made a priest, and for forty-five years he lead the ascetic life of a fool-for-Christ, abiding in ceaseless prayer, fasting, nakedness, and with total disregard for his own body. The venerable priest Maxim was distinguished even during his lifetime by his grace-filled gifts from God. He reposed in deep old age on January 16, 1650 and was buried near the Varnitsa Resurrection in Totma. His holy and laborious life, and the miraculous healings that came from his grave, inspired his contemporaries to compile his Life, but this Life burned in a fire at the Resurrection Church in 1676. Later, in 1680, a new Life was compiled after the first was lost. Meanwhile, the miracles continued happening at the venerable one’s grave. In 1715, the priest of the Resurrection Church, John Rokhletsov, and parishioners petitioned Archbishop Joseph of Veliki Ustiug for permission to place a grave-reliquary over the relics of Saint Maxim in the Church of Saint Parasceva, which was built over those relics, and place an icon on the Saint’s grave-reliquary. His Eminence gave his permission and blessed them to serve molebens to him as to all the other God-pleasers. At that time there were yet other memorable miracles that happened at the place of Venerable Maxim’s grave, and these miracles were depicted on the margins of the icons that adorned the God-pleaser’s reliquary. In 1680, Boris Timofeyev Tarunin of Totma fell sick with a bad fever and lay paralyzed for a half year. 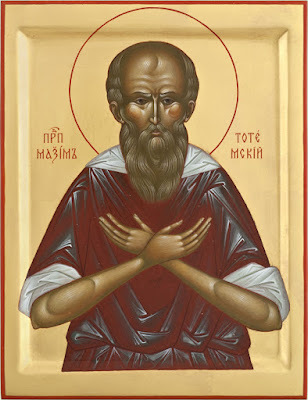 When he called on Venerable Maxim for help, he immediately received healing. In 1691, peasant Arethas Malevinsky could not rise from his bed for nine weeks due to a fever. But when he called for help to Venerable Maxim, his sickness went away completely. Peasant Theodore Vasiliev Mamoshov was ill for nine years, paralyzed. On the night of November 5, 1703, he had a dream in which he saw an old man wearing only a long shirt came to his bed and said to him, “Theodore, stop your sorrowing.” And taking him by the shoulder, he led him to the church to venerate the grave-reliquary of Venerable Maxim. When he woke up, Theodore felt so healthy that he was able to walk to the Resurrection Church to venerate the grave of his healer. Anna Yakovleva Tataurova, in 1705, was out of her mind for a month. Venerable Maxim appeared to her at night in a dream and told her to have two Pannikhidas (services for the dead) served over his grave, promising she would recover if she did so. When she awoke, the sick girl regained consciousness and asked to be taken to the venerable one’s grave, where after two Pannikhidas were served she immediately felt completely healthy. Thou didst please God by thy blameless priesthood, and choose to be a Fool for Christ in the midst of worldly tumult; thou didst take up the Cross and follow Christ, drawing near to Him in unswerving thought and love. Disdaining all things earthly, thou didst receive the things of heaven. Pray to Christ our God to keep thy flock unharmed and to save our souls, O holy Father Maxim. Thou didst hear the divine voice of the Gospel and joyfully follow it into the heaven of dispassion. Thou didst cleanse thy soul and body by prayer, fasting and stream of tears, extremes of weather, humbled thoughts and being reviled of men; thou didst pray for those who assailed thee and say: O Lord, lay not this sin to their charge. Even after thy death God glorifies thee with miracles and teaches all to cry to thee: rejoice, holy Maxim, our father.